For quality farm equipment, trust Herrington Equipment, Inc. in Hollywood, SC. We carry a complete line of Massey Ferguson Equipment for the ultimate in versatility and durability. 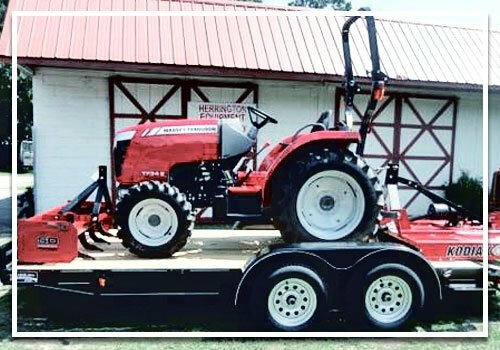 Our reliability and quality service have made us the best Massey Ferguson provider in the Lowcountry area. Herrington Equipment, Inc. in Hollywood, SC is a family-run equipment business that has been offering sales, service, and parts on tractors and equipment for folks in the Lowcountry area, SC for more than 65 years. We offer the best landscaping, garden and lawn equipment available from trusted names such as Massey Ferguson, Bush Hog, Caroni, Echo, Hardee, Husqvarna, LMC and more. And we service what we sell! Should you need reliable farm equipment, we are ready to help. If you need a leaf blower for your lawn, we will provide it for you. We offer the best parts and service that customers have relied upon for more than 65 years. For more information on the products we carry, give us a call or email us today. “Generations of Experience at your Service” is our company’s motto. We have three generations of experience which gives our dealership a unique edge. We are simply the best choice when it comes to your lawn, garden, and farm equipment needs. While we stock many well-known manufacturers products, our company has the ability to order practically any type of equipment you may need to get the job done. We carry only the best equipment brands. Click on any of the logos below to view equipment products on the manufacturer website and then give us a call for the best deal around. Remember we service and carry parts for everything we sell.